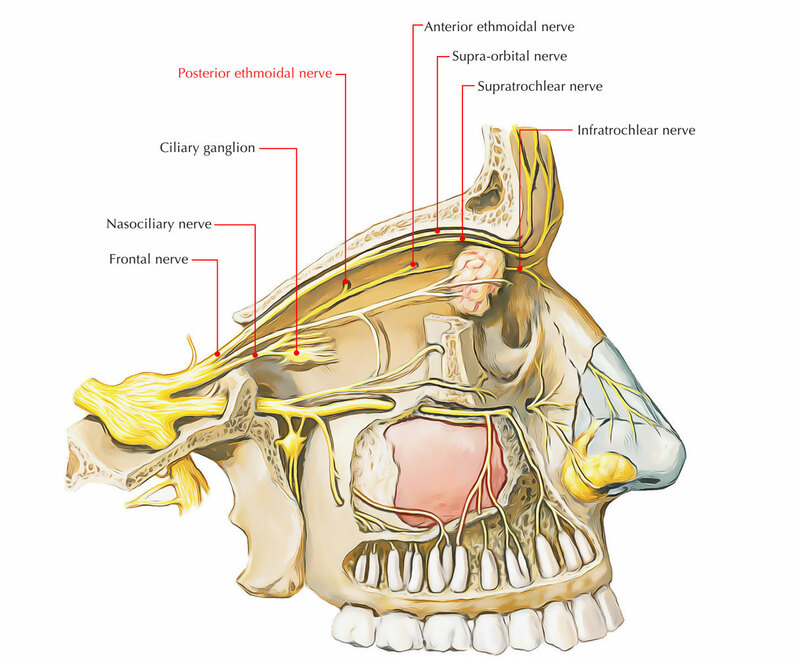 The posterior ethmoidal nerve originates from the nasociliary nerve, a branch of ophthalmic division of the trigeminal nerve. The posterior ethmoidal nerve exits the orbit from the medial wall of the orbit via a similar canal. It divides proximally towards the infratrochlear nerve and trsvels from the medial part of the extraconal space of the orbit. Via the posterior ethmoidal foramen it leaves the orbit. It does not spread out into the nasal cavity and concludes by innervating the mucosa of the ethmoidal cells as well as sphenoidal sinus. The posterior ethmoidal nerve is not present normally. When present, it gives sensory supply towards the posterior ethmoidal as well as sphenoidal sinuses.